Many magickal ceremonies call for the lighting of ritual candles, often as a safe and easy way to utilize fire’s nearness to the spirit, thus resonating with the vital forces permeating the cosmos. Often the recommended candles are white and black, unscented, and given to certain strict roles in the working of a spell or incantation. What a bore! Ceremonial magick is a powerful science for commanding the forces of the otherworld, but that’s not really my bag. I would no sooner use Solomon’s Goetia of enslaved spirits than I would a Russian mail order bride. I like my spirits like I like my food: local and organic. Alternatively, those interested in Taoism might only use two candles for yin and yang; Druids might use three for land, sea, and air; Native Americans could use four for the spirits of the cardinal directions; Jews six for the star of David; and Cabalists ten for the Sephirot. If your into zen, hell, one will do! 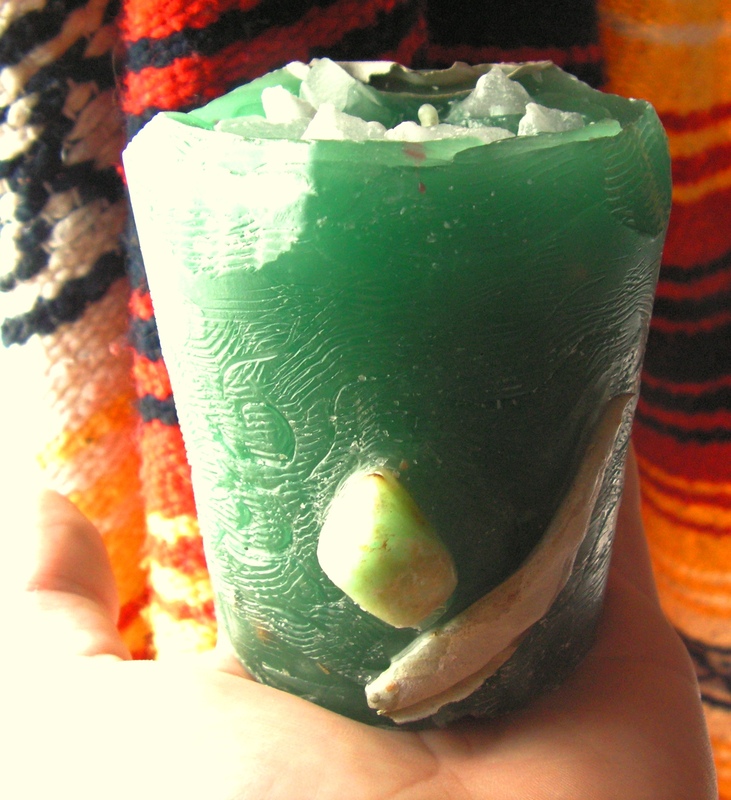 The important part is attuning your candles to your environment and your beliefs, creating a microcosm with which to work with the vast energies of the elements, and penetrate their power to manifest your desires, mature spiritually, or see into the mysteries of the earth. The more you use local materials, the stronger your candles will harmonize with your environment, making any spiritual practice more effective. Just as certain terrain and seasons correspond with certain elements, so certain herbs will help that resonance. Think of how the plants act, how they make you feel, where they grow… Which herbs best correspond to the elements in your area? These I would suggest for making your candles. If you’re looking to do grandiose earth-shaking magick then maybe you could opt for exotic herbs from the far corners of the globe, but I find building a bond with the spirit of the land that you live with is more deeply touching for those not interested in the New Age ideal of globalization-via-enlightenment or other majestic fantasies. On the other hand, if you’re trying to work magick at a distance, using plants that grow in that locale will greatly increase a spell’s effectiveness. Some uses for these candles I’ve found are to work weather magick (along with a wand or feather), to understand the roles of the blending of the elements in life and nature, to heal or purify people and spaces, to bring balance where balance is lost, to make friends with elementals or nature spirits and ask them for wisdom or help (though the lower order of elementals is infamously untrustworthy—go for the highest order of beings possible), to develop your second sight by moving through the elements in the astral realm, or to simply meditate on the nature of the earth, its cycles and spirits. A basic Indian candle meditation can be found here. Really your imagination is the limit to the possibilities—these candles are meant to represent all the types of matter which make up the universe, not just the earth. In esoteric occult science, clouds would fall under the “air” element, ice would be categorized under “earth”, stars under “fire”, and molten lava under “water”. So don’t just think of these as the elements which make up the earth. They represent all possible states of matter. 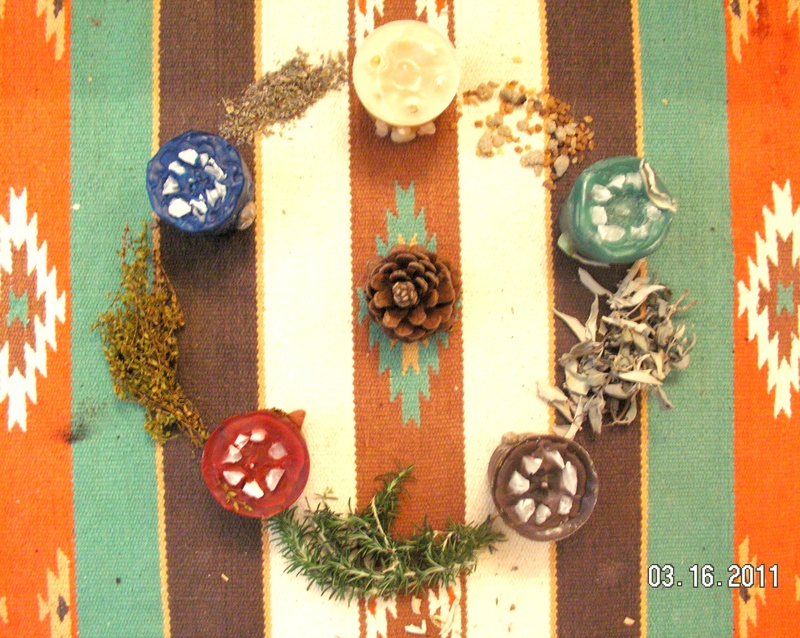 Since I’m currently in the Mojave desert of the Southwest, I chose herbs that are either native to the area or easily and widely gardened with the exception of frankincense and myrrh for the spirit candle, because, c’mon, it’s classic. For wind, I chose sagebrush; for earth, rosemary; for fire, creosote; for water, lavender; and for spirit, again, F&M (although juniper would have been a perfect local alternative). I tried to match the best I could the feeling of an element with the feeling of an herb’s soul. A short list of another person’s opinions can be found here. As a general rule, air should be invigorating, uplifting, and light; earth pungent, dense, and rich; fire spicy, strong, and intense; water smooth, lulling, and easy on the nose; and spirit purifying, harmonizing, and balanced. As for color, I used green for wind; brown for earth; red for fire; blue for water; and white/off-white for spirit. 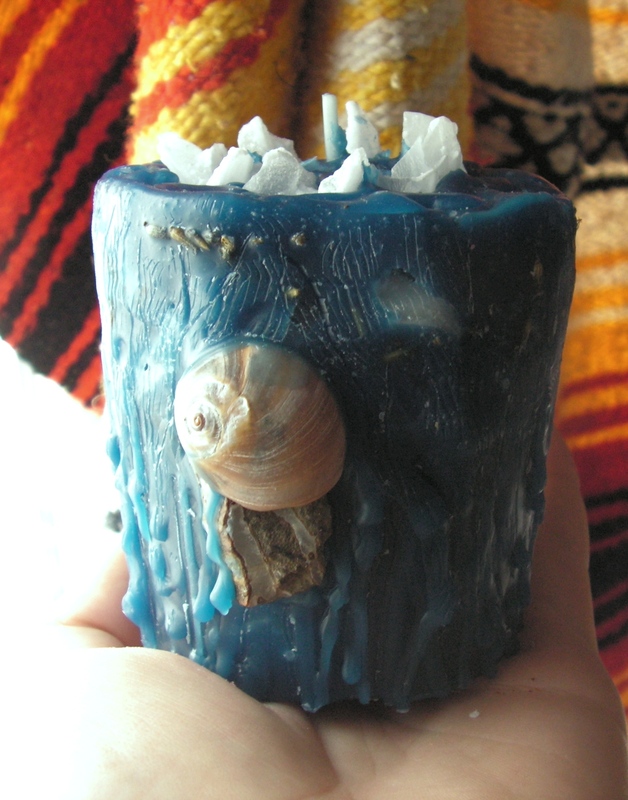 I also put little hunks of wax “crystals” like a crown around the wick of each candle, symbolizing the fact that all the elements revolve around spirit. Many sources would suggest yellow for wind and green for earth, and even black for spirit or æther (“Darkness within darkness—the gateway to all mystery”). My options were limited by the colors of candles I had to recycle, but I feel pretty good about what I came out with. Mixing waxes like paints usually works, but some colors (like red) are typically stronger than others. Brown is made by combining complementary colors (such as green and red). I used the same intuition to pick rocks I had lying around to decorate and enhance the spiritual resonance of each candle. Using local stones, like herbs, enhances the magickal resonance (though I didn’t this time). For wind, I used chrysolite; for earth, jade; for fire, a red agate; for water, blue chalcedony “flowing” through stone; and for spirit a clear oval crystal (a “dragon egg”) surrounded by six points of rose quartz to trace the “as above, so below” symbol of the six-pointed star and to resonate with the heart. Other good options are amethyst, azurite, or turquoise (!) for air; petrified wood, amber, or garnet for earth; obsidian, sunstone, or tiger’s eye for fire; aquamarine, lapis, or sapphire for water; and quartz, herkimer, moonstone, or opal for spirit. Again, the decisions correspondences I made were based on my own feelings. There are no rules, which makes this form of candle making and ritual meditation an art of creativity, self discovery, and down good jolly ol’ gee-haw fun. Different authorities will argue about what colors, herbs, and patterns attend the different elements, but I find this to be anything but universal. Just use your intuition, do what feels right. That’s what will give your candles power. The basic ingredients for candles are wax and wick (and witch, of course). (1) Sheets of beeswax, warmed until soft with a blow-dryer or the heat of the sun and scattered with crushed herbs, can be rolled around a wick into candles. The beeswax has a honey-like scent that may mask the smell of the herbs, but can you really complain about a little essence-of-honey? Since there’s no boiling in this method the herbs should burn straight up like a smudge. When cooled, you can carve designs into the wax. This is by far the easiest method of candle making. (2) Smallish chunks of store-bought wax (paraffin or soy—available at craft stores, etc. ), or wax from recyclable candles you have lying around (which I used) are melted down in a double boiler. A double boiler consists of two pots or saucepans. You fill one larger pot with enough water to float a smaller pot, and into this smaller pot you put the wax chunks. Boiling the water in the bigger pot over a stovetop or fire transfers all the heat you need to melt the wax. -Add dry dry powdered herbs for scent. Be careful not to let any water get into the wax pot because this is a flammable combination. -After melted, pour the wax into a mold made of foil (will be hot! ), metal molds available at shops, newspaper for a crumbled effect, or . 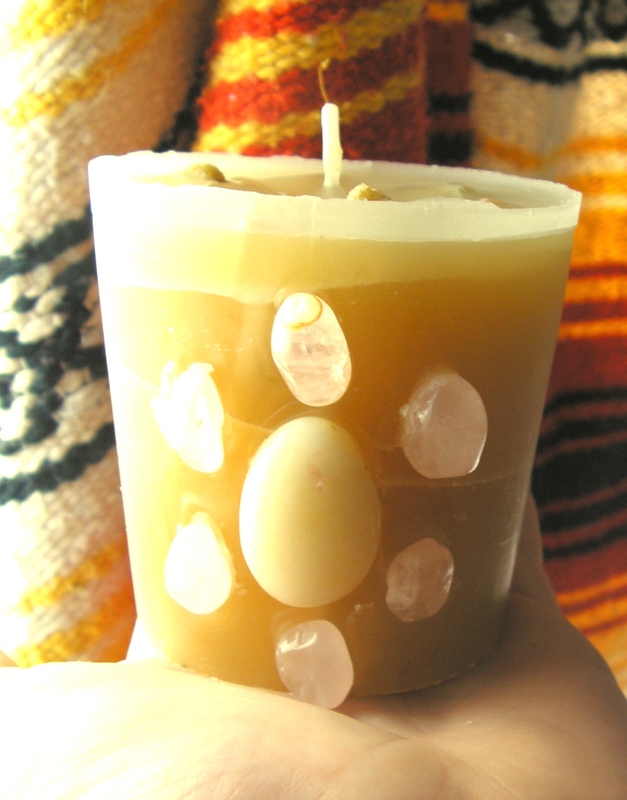 Use a cardboard or paper disk with a hole punched in the middle to center the wick. -Allow to cool for a day or two and remove the mold. Or, you could cheat and put it in the fridge or freezer like I did which results in cracks in the wax which look archaically cool. 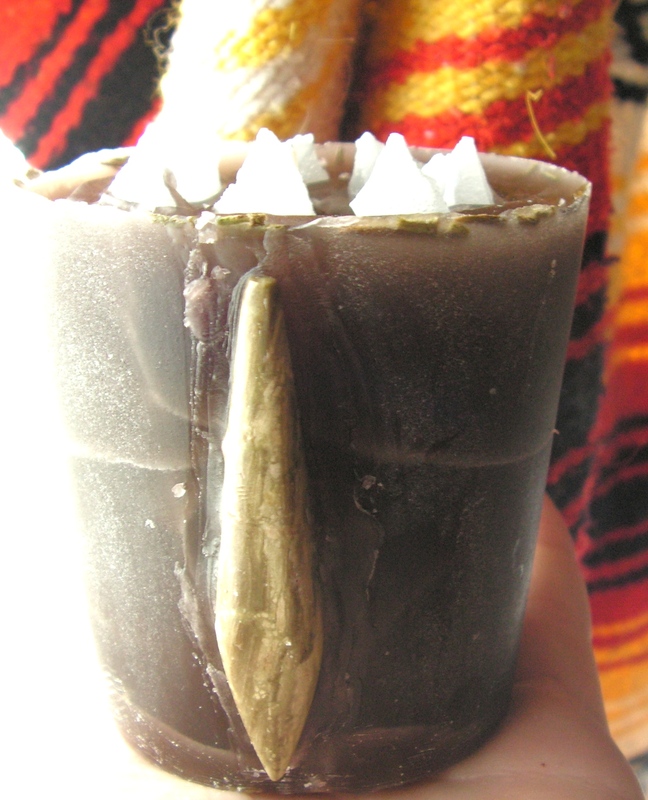 -As it starts to solidify, the wax will form a depression around the wick because of the extra tension. Either poke holes around it to relieve the pressure after a film has formed on the top of the candle, or keep some extra wax aside to pour on top after the candle has cooled. This second method is by far prettier. I used this method and found that not all herbs produce intense fragrance. Sage and creosote were the most effective. An alternative is adding essential oils rather than actual herbs, but I figure if the scent can’t be that strong then the sympathy of the herbs should be enough to produce magickal harmonies. Remember, like attracts like. (3) The old school method of making candles out of tallow (boiled animal fat) adds some genuine craft and provides a truly natural base. Tallow is also good for making soaps and salves, so if you’re in the habit of processing animals it’s a good step in utilizing the whole carcass. Two methods for making tallow are found here and here. The same double-boiling with crushed herbs and molding method from (2) is then used to form the candles. (1) Buy them in a store, dummy, or collect them from the candles you’ve recycled. (2) Cut hemp or undyed, braided cotton string into proper lengths. Melt a little wax and dip the string. Once they are saturated, remove them and squeeze out the excess wax by running your fingers along the length of the string (caution: they will be hot!). Hang to dry and repeat a few times. 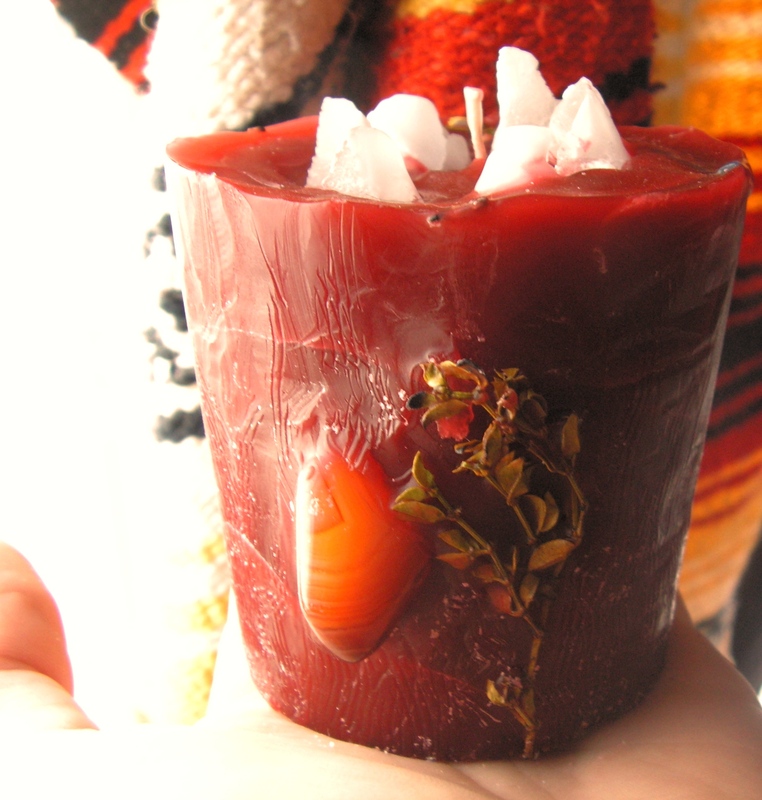 Make sure that the melted wax isn’t so hot that it melts off the pervious layers of wax the wick has collected. Keep at it until a test shows the wicks are burning slow enough to work for a candle. (3) A more solid and reliable version of (2) consists of soaking the wick fibers in a solution of 2 tbsp. of salt and 4 tbsp of borax, dissolved in warm water. Soak for fifteen minutes and then prime the wicks as in method (2). Decoration: To inlay stones, gouge out roughly the shape and depth of the stone. Lay or hold the candle horizontally and melt the indented surface until you have a pool of wax. Place the stone in the pool and smooth the displaced wax around its edges. For things like shells or sprigs of the herb, use the same method with a little tweaking. Carve cool lines to represent the tendencies of the elements with a serrated knife, or get more creative with your craving patterns. Concecration: Concecration is the act of dedicating tools for a specific spiritual use. In other words, in order to imbue these candles with powerful energy and preserve that intent, you don’t want to use them for lighting a romantic dinner or a bubble bath. Keep it holy. Ordain them with their attendant elements (water for water, earth for earth, etc.) at the proper times of day (morning for wind, noon for fire, dusk for water, and night for earth; for spirit under a full moon, a solstice sun, a rainbow, or on any day where you feel especially high on light should work wonderfully). Concentrate single-mindedly on what these elements represent both in the natural and spiritual world. Meditate on their respective places in the I Ching and its fundamental trigrams. A good way to concecrate is to read the beautiful poems provided below from the Essene Gospel of Peace. The air is the realm of thought, vision, and intellect, home of the sweeping winds that rush freely over the earth, breathing life into all. The vastness of the sky is eternal, its freedom epitomized by the wandering of the winged birds, its wisdom epitomized by the winged angels. “Angel of Air” from the Essene Gospel of Peace. Earth is the receptive mother of all life, the cosmic womb, strong and resiliant, upholding all things without exception, our eternal home as living beings. All arises from eath and all returns, nothing is ever lost from its indestructable soul of rock, sand, and soil. “Angel of Earth” and “The Earthly Mother” from the Essene Gospel of Peace. Fire clings to earth, it is dependent on earth, the material, for its very existence and yet is something comepletely different. Fire is the consumer, that which transforms in an act of destruction and creation at once. It is the source of all light and warmth, as the “fire” or hearth of the body and home nourishes one life by consuming another. It is the one element, according to Rudolf Steiner, that we do not feel as “other” because sensation itself is warmth, and warmth itself is flame. “Angel of Sun” or “Angel of Life” from the Essene Gospel of Peace. Water is the “abysmal” in the I Ching, it always flows down and down and down until it meets with resistance. It resembles the soul’s return to God in its journey from drops of rain to streams, from steams to rivers, and from rivers back to the ocean. Water is clear and pure; it refreshes and heals all life. One could even say that the highest medicine is water. “Angel of Water” from the Essene Gospel of Peace. Spirit is the all-pervasive “circle whose center is everywhere and whose circumferance is nowhere.” It is the breath of cosmic life, the force which animates all the universe and unifes all existence as one. For more on the spirit, see my article Meditations on the Nature of Spirit. “The Angel of Eternal Life” and “The Heavenly Father” from the Essene Gospel of Peace. The dried herbs in these candles will catch fire themselves! Beware of burning where stray flames or embers could catch something on fire (like long white robes for instance). If the wax catches fire while boiling, smother with a cloth. Adding water will only exasperate the problem. It’s not necessary for the water to boil like a lava pit, just a light simmer does the trick and keeps the inner pot stable. On a spiritual note, beware when choosing which spirits you deal with, befriend, and allow to hang around. Sometimes I’ve found that being enchanted by the mystery of spiritual beings has been a stupid move that didn’t only have an ill affect me but also those around me whom I love. However, they can also be kind of fun. Gnomes (earth elementals—the most likely to follow you around and doddle in your house) can be pesky little poltergeists, moving things around and stashing your stuff. Sylphs (air spirits) can confuse and distract, inspiring a frustrating lack of decisiveness and too much daydreaming. Salamanders (fire spirits), as you might guess, can have obvious chaotic effects—I know of a mysterious case in Portland where two houses where magick was practiced burned down within a week of each other with no foul play or candles involved. So be careful! And above all, be very wary of beings appearing as shadow, even if they’re not obviously threatening, and especially if they claim to be powerful, ancient deities. These bastards love to do that, but they’re just a type of spirit called shadowen who feed on negative energy, inspiring fear, depression, or hatred in their prey. Get rid of them by calling on the powers of light, love, and courage, all of which they’re allergic to. Enjoy your candles! Be creative and safe in your shamanic journeys, metaphysical revelries, and flights to ecstacy! This entry was tagged candle, candle making, diy, elementals, elements, essene, herbs, magick, meditation, pentacle, ritual, stones, wicca. Bookmark the permalink. Hi, Neat post. There is an issue with your website in internet explorer, could check this? IE nonetheless is the market leader and a large part of people will pass over your fantastic writing due to this problem.